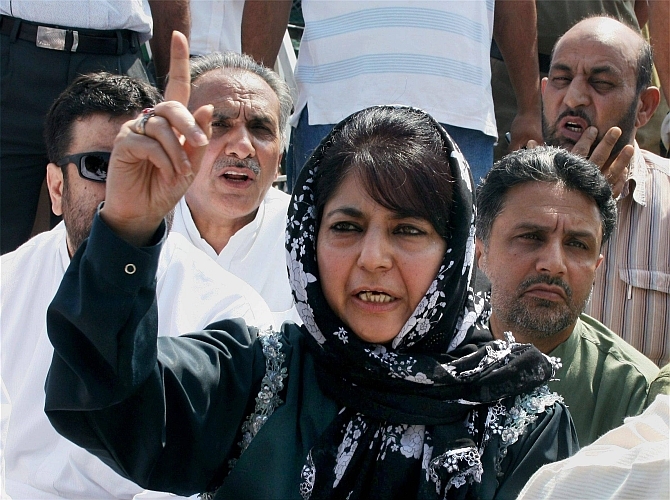 Rediff.com » News » A year on, can Mehbooba preserve Mufti's legacy? A year on, can Mehbooba preserve Mufti's legacy? One year after his death, Mufti Mohammad Sayeed's legacy stands crucially poised, says Mohammad Sayeed Malik. 2. If it had broken out in spite of him, would he have handled it differently? Be that as it may, Mufti's successor-daughter, Chief Minister Mehbooba Mufti today finds herself at the receiving end of this guessing game. She is being held responsible on both counts: Not anticipating the trouble and not being able to control its tragic fallout. And for understandable reasons, she must miss her 'daddy’' more than at any other moment. Mufti's (2002 to 2005) three-year first term as chief minister in the PDP-Congress coalition government had established the competence of his leadership beyond doubt. He had come to be respected for that rare quality among local rulers. Going by the comparatively poor turnout at his funeral, especially in the South Kashmir bastion of his Peoples Democratic Party, Mufti's popularity graph appeared to have dipped in the wake of his alliance with the BJP (after the 2014 fragmented assembly poll outcome). His luck did not give him time to vindicate his controversial decision. That is also why it took Mehbooba nearly two months to make up her mind on whether to step into her father's oversized shoes and carry forward his legacy. Less than a year's time in office was otherwise also too short a period for Mufti to convince his supporters and remove the reservations amongst the Valley-centric PDP against its unpopular alliance with the BJP. Mufti must have been relying upon his administrative capability to deliver on the performance front to soften attitudes. But a series of distracting intra-coalition bush fires consumed most of his available short time. The creaky alliance, riven with congenital deformities, might have collapsed, but for his patient handling. No mean achievement. That also explains Mehbooba's unexpectedly long indecisiveness and resultant political uncertainty necessitating imposition of governor's rule until she made up her mind and took office last March. But once she made up her mind and took the plunge, she was able to stamp it with popular accreditation with her election to the state assembly from the Anantnag constituency that was earlier represented by Mufti. Nearly 35% voter turnout in the solitary by-election, in south Kashmir, within three months of her father's thinly attended funeral came with an unexpected bonus: Anger over the PDP-BJP alliance appeared to have subsided after Mufti's death and the popular mood softened towards Mehbooba's succession. Mufti's legacy started breathing again. The honeymoon with popularity, however, was not to last long. It was violently cut short in the aftermath of the post-Burhan Wani uprising in the valley within just a couple of peaceful months. Even so, the fact that PDP cadres at the grassroots were able to face and survive the devastating onslaught of the four month-long mass upheaval across the valley and that there were no desertions from their beleaguered ranks shows that the glue of the Mufti legacy had not dried up. In the context of volatile Kashmir politics that means a lot. However, its post-Mufti political efficacy remains yet to be tested. The by-election to two Lok Sabha seats expected to be held later this year could provide some indication. The seats were vacated by Mehbooba and her alienated PDP colleague Tariq Hamid Qarra who resigned in belated protest against the PDP-BJP alliance. The Kashmir valley remains the state's main political battleground. Compulsions and pulls and pressures of this tangled mess were the main reason for Mufti Sayeed to take his own time, after the fractured verdict of the 2014 assembly polls, before opting to swim against the popular current and go for an unlikely alliance with the ideologically incompatible BJP. All through his over half a century-long political career Mufti had courted similar uncertainties to carve his own trajectory on the state's political horizon, from being a virtual non-entity in the early 1960s to emerging as a front-rank contender in the 1990s. The side effects of his long, close, linkage with a national mainstream party, the Congress, did not come in his way of gaining regional ascendancy, primarily because grassroot politics was his USP. After Mufti's rather sudden absence from the scene, much now depends on how and to what extent Mehbooba is able to strike a workable balance between her twin functions as the chief minister of a heterogeneous coalition and as the president of her party that is emerging out of an abrupt, agonising leadership transition and an explosion of mass anger on the ground. Notwithstanding his vast organisational and administrative experience Mufti always liked to keep his ear to the ground. His capacity to remain connected with the cadres and masses was phenomenal. Given this background, it is evident that while knitting his alliance with the BJP, Mufti must have reckoned with its negative fallout upon his political backyard. To his bad luck, fate was not on his side. His sudden demise within less than a year in office, as the coalition chief minister, threw his followers into a very difficult situation. The multi-faceted demands of the legacy weigh heavily upon his natural successor, Mehbooba, who was not prepared to shoulder the burden that soon, despite her proven grassroot skill and long organisational experience. Her convincing by-election victory, against odds, came as a timely morale booster. She was able to overcome the depressing effect of thin attendance at her father’s funeral a few months earlier. There is no doubt that the post-Burhan upheaval has turned the political field upside down, largely to the disadvantage of the PDP. That there were no desertions from the ranks is a positive sign of the party's health. Anyone with some knowledge of the tricky nuances of Kashmir politics would testify that this is no mean achievement. Mehbooba's administrative calibre is yet untested though her organisational skill is highly rated. The fate of the Mufti legacy would be largely determined by how she is able to deliver on the governmental front. How the coalition functions in the second half of its tenure and under Mehbooba's stewardship would also have much to do with how New Delhi chooses to play ball with her. The credibility of both is very much on the line. Mufti had invested huge political capital into this bargain. To a great extent, the propulsion of his legacy crucially hinges on the functional end result of the existing political arrangement.